Winged jug, a photo by The Bacher Family on Flickr. 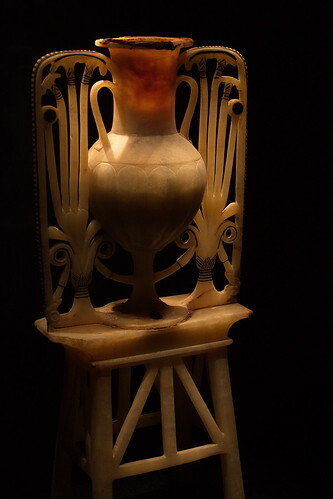 An exquisitely carved jar from the King Tut exhibit at Pacific Science Center. Can you imagine the hours and hours of work that went into carving this piece from a single block of source material? And I love the way they've done the lighting at the Science Center, spotlighting the artifacts so that the background disappears with an exposure metered on the foreground.